This is the northern section of the Burgundy Canal. The canal flows from the south east to the north west and emptys into the river Yonne. The river Yonne the flows into the river Seine. This is the central section of the Burgundy Canal on the northern side, the town of Pouilly en Auxois being at the summit. The river Armoncon flows laterally along side the canal feeding and storing water where necessary. You will also notice the towns of Montbard and the historical town of Semur en Auxois. 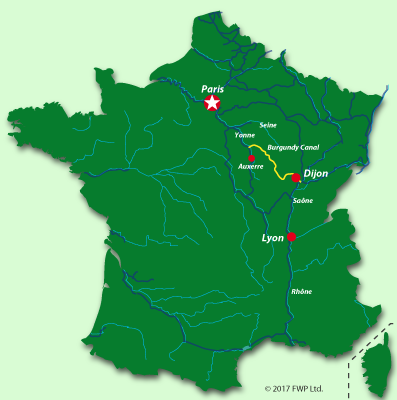 This is the southern part of the Burgundy Canal, the water flows south-east and downstream from Pouilly en Auxois, through Dijon, to the river Saône. The river Ouche flows through the market town of Bligny sur Ouche and joins the canal at a very small village called Pont d’Ouche. The Ouche is used to increase the supply of water to the canal. The canal empties into the river Saone at Saint Jean de Losne, whilst the river Ouche joins the river Saone a few miles to the north. The Saône river flows south and joins the river Rhone in the center of the city of Lyon. 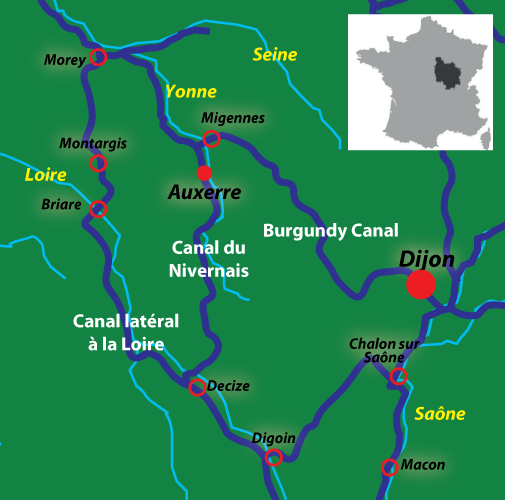 A detailed map showing the canal, rivers, villages and main towns in the Burgundy region. This map is a PDF version which you can download OR you can simply click here to view the map (the map will load in a new window). Interactive FLASH map showing all the villages, this map allows you to view all the villages along the canal, and is the perfect tool to plan your barge trip.